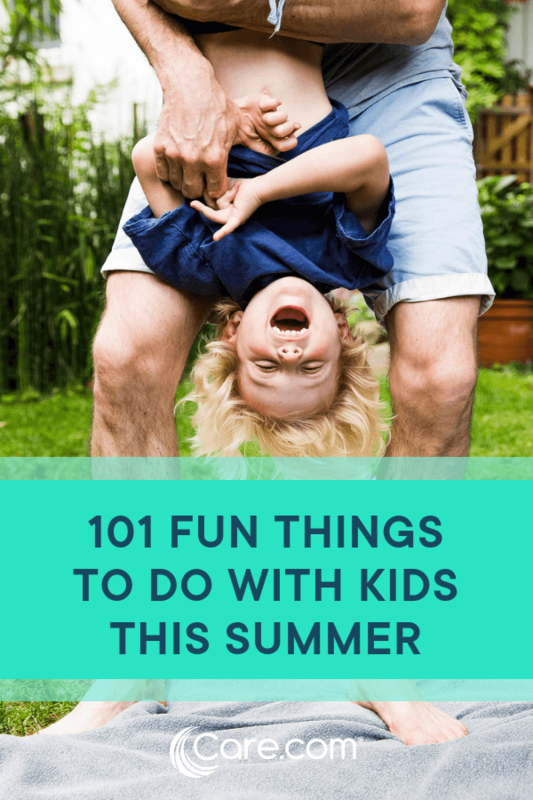 Try these 101 ideas for activities to keep kids from getting bored this summer and create memories that they'll have for a lifetime (or at least for that first day of school when the teacher asks, "What did you do this summer?"). Want help making your way through this list? Share this with your babysitter or nanny to do with your kids during the week. Bake cookies for ice cream sandwiches. Make a photo journal or a family yearbook. Visit the beach and collect shells. Make a fort out of cardboard boxes. Stage an A-to-Z scavenger hunt, where you have to find something that starts with every letter. Or try one of these other scavenger hunt ideas. Make ice cream. You can even try using YayLab's ice cream ball, which you fill with ice cream base and kick around until frozen. Write and illustrate your own book and have it published into an actual hardcover book using IlluStory. Set up an ice cream sundae buffet for dinner. Clean up trash at a park in your neighborhood. Have a backyard campfire ... or just use the grill! Roast hot dogs on sticks, pop popcorn and finish off with s'mores. Go for a nature walk and then make a collage from objects you find along the way. Head to a creek and look at the ducks. Set up a lemonade stand and raise some money for a good cause. Have a water balloon toss ... or fight! Practice your origami skills and make construction paper crafts to hang from the ceiling. Interview a grandparent or an older relative about what life was like when they were young. Plan a picnic at a local park — or in your backyard. Save this list of Caldecott Medal-winning kids books, and visit the local library throughout the summer and try to read as many as you can. Create salad spinner art by placing circles of paper inside a cheap salad spinner, dab tempera paints on top, cover and spin away. Practice making interesting shadow puppets and then put on a show with your characters. Make a sidewalk chalk mural and invite the neighbor kids to join in the fun. Go ice blocking (sledding) on grass with a towel-covered block of ice. Have an outdoor painting party using huge canvases or cardboard. Plant a butterfly garden with flowers. Pretend to be pirates for a day — dress up in costumes, plan a treasure hunt and talk like a pirate. Make an indoor "sandbox" using colored rice by mixing 4 cups of rice, 3 tablespoons of rubbing alcohol, and a few drops of food coloring and and letting it dry overnight. Turn the backyard into a carnival — set up a face painting area and games like ring toss. Make totem poles out of paper towel rolls and decorate them. Visit a museum you've never been to. Make a giant hopscotch or Twister game on the lawn (with spray paint) or driveway (with chalk). Learn about stargazing and identify as many constellations as possible — see if there are any local astronomy groups for kids. Go fossil hunting near a lake. Break out your baseball glove and start a game, sandlot style. Make paper boats and race them in a kiddie pool using straws to propel them. Play mini-golf — or set up a course in your driveway by laying different size containers on their sides. Make a sand art garden and plant a succulent. Get a map of the United States and mark off all the exciting places you want to visit — create the ultimate road trip. Set up a net and play badminton and volleyball. Or try one of these other backyard games for kids. Visit an amusement park or water park. Wade through a stream and search for minnows or tadpoles. Have a tricycle race at the park. Collect rocks and paint them to use as paperweights or pet rocks. Visit a zoo or aquarium to learn about animals. Blend your own smoothie — they're good for you! Set up a bike wash and raise money for a local charity. Batter up at a batting cage. Let kids paint the sidewalk or patio with plain old water and sponge brushes. When their creation dries, they can begin again. Bake cupcakes in ice cream cones and then decorate them. Assemble a family cookbook with all your favorite recipes. Make popsicles in Dixie cups using fruit juices. Catch fireflies in a jar (and let them go at the end of the night). Stage your own Summer Olympics with races, hurdles and relays. Create a backyard circus — kids can pretend to be animals and dress up as clowns. Decorate bikes and have a neighborhood Fourth of July parade. Make Mexican paper flowers using different colored tissue paper. Volunteer at an animal adoption organization. Visit a retirement home and read stories to residents. Pick a nearby town to visit for the day. Mark off all the local parks on a map — then visit them, take pictures and vote for your favorite. Take in a fireworks exhibit. Make crafts with recyclable items like stickers using old photos, magazines and repositionable glue. Make your own hard-to-pop bubbles with 1 cup of distilled water, 2 tablespoons of Dawn dish soap and 1 tablespoon of glycerin. Paint canvas sneakers with fabric paint pens or acrylic paint. Create three-dimensional buildings using toothpicks and mini marshmallows. Make bird feeders by covering pine cones with peanut butter and rolling in birdseed. Paint with ice by freezing ice cube trays with washable tempera paint. Create unusual s'mores by experimenting with ingredients like cookies, bananas, mini candy bars, flavored marshmallows and white chocolate. Make a giant slip-n-slide with a painter's tarp and shaving cream. Go camping in the backyard or at a campsite. Let kids paint each other with washable tempera paint and then wash it off in a sprinkler run. Go to a ballgame and teach your kids (and yourself) how to keep a scorecard. Set up a tent in the backyard to use as a summer playhouse. Take a free kid's workshop at stores like Lowe's, Home Depot or Pottery Barn. Have a game night with charades, Pictionary and bingo. Let kids brainstorm creative things to do with a boring brown paper bag — you'll be surprised at how many things you can come up with. Like it is rightly said in the article it is good to have fun with kids, play with them at least once or twice a week. I suggest if any one is looking for a good play school/pre school visit the website of Planet Kids. I like the idea of going onto a trip because me and my family are going to a trip on the last 9 days of summer. Plus my brother is going to miss the first day of 6th grade and I am not because my brother is starting a day early and I am in 7th grade ,so, I am very happy that is not me. and if you are wondering what school i am going to and that is Clpms in Laporte. So I am going to have so much fun going on a trip!! And maybe when you are listing maybe not text has much. So, maybe list and when you are finish with the list than write what you are going to say. Like this: 99. fishing Fishing is fun because you get to go outside. Like that. To me that looks better. Than this. 99. fishing, fishing is fun because you get to go outside. That is better.